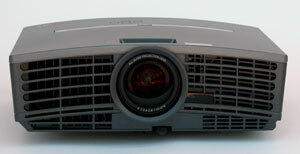 Last fall Mitsubishi released a remarkable low end 720p resolution home theater projector--the HD1000U. It delivered a sharp, beautiful, high contrast image for under $1000, and we gave it our Editor's Choice Award as a truly outstanding achievement. Now comes an update to that model, the HC1500, which has just begun to ship in the last couple of weeks. There isn't much difference between the new HC1500 and the HD1000. But then, at street prices below $1,000, there wasn't much room for improvement. Both models are exceptional performers for the money. Light Engine: 1280x720, native 16:9, 0.6" single-chip DLP, with a 7 segment 4x rotation speed color wheel and a 200W lamp. Video Compatibility: 1080i, 720p, 576p, 576i, 480p, 480i. NTSC/PAL/SECAM. Connection Panel: One HDMI port, one 15-pin VGA port, one set of YPbPr component inputs, one s-video input, one composite video input, one 12V trigger, one serial port, and one USB port. General Impressions/Performance This will be a very short review, as there is not much to say about the HC1500 that wasn't already said about the HD1000. In terms of specifications, the only difference is that the HC1500 is rated at 1600 ANSI lumens, whereas the HD1000 was 1500 lumens. We did measure our HC1500 test unit as being slightly brighter, but the difference was detectable only by a light meter and not visible to the human eye in a side by side test. The only other difference between the two models is that the HD1000U was a flat medium gray, and the HC1500 is a slightly darker shade of gray. The two models share the same lensing, with a 1.2x zoom lens and no physical lens shift. So buyers need to plan carefully for the placement of the projector for any given screen size since the options are limited. In side by side viewing, we could find no noticeable differences in image quality or characteristics. Basically, in all ways other than the case color and a very slightly brighter image, they look like the same projector. So instead of rewriting the entire HD1000 review, we will simply ask that you read the HD1000 review. The observations regarding performance and practical considerations made therein apply equally to the HC1500. We already used up all of our superlatives in praising the HD1000U, and our enthusiasm carries over to the HC1500. Both will be granted the Editor's Choice Award. The bottom line is this: if your installation can accommodate the limitations of its zoom range and fixed throw angle, you will not find a better picture for the money under $1,000 at this time.